Although we can do more than 15 letters, its best to keep the front 15 or less, same goes for the back name. We can do up to 3 numbers on the back but it might look cramped. We recommend 1 or 2 numbers only. All letters will be capital. Only time we use a lower case letter is for a name like McDONALD with a lower case "c". Print colors: Black, White, Red, Gold, Pink, Maroon, Royal Blue, Navy Blue, Athletic Gold, Purple, Green, Forest Green, Yellow, Gray, Orange. Need a different print color, contact us. 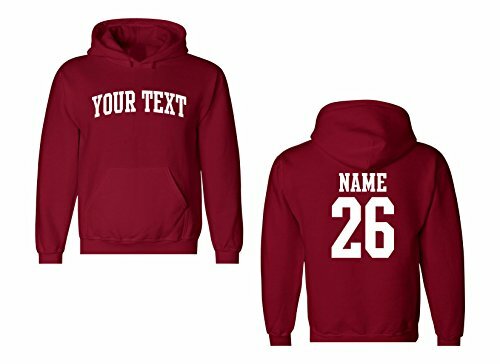 We also carry this item in crewneck sweatshirt, long sleeve, tank top, raglan baseball style shirts, and short sleeve shirt sizes including men's, woman's, youth, toddlers, and infant sizes. Some items are limited to certain colors and sizes. We are always adding new inventory so if you do not see a size, type, or color your looking for you can always contact us for availability. If for any reason you are not happy with your purchase please contact us before leaving a bad review. We will fix any issue you have GUARANTEED! This includes all items custom and non-custom. Any mistake or defective item will be replaced free of charge. 95% of all orders ship out the next business day. In some cases it can take up to 2-3 business days to ship out. Delivery transit time is 1 to 6 business days depending on your location. We are located In California. We offer a 30 day money back guarantee for this item. Orders over $50 will incur a 20% restocking fee. Item must be un-used with tags, item must not have any odors including but not limited to cigarettes and pet odors. You can also exchange for different size or color. Buyer pays return shipping to return item back to us. Gildan 12500 printed using only commercial grade equipment to insure top notch quality. 14 shirt color options and 16 print color options available. If you don't see a color or size your need, contact us for availablitity.